The Six Flags theme park empire announced it would shut down its most famous wooden coaster, Colossus, in California, CBS News’ Carter Evans reports. 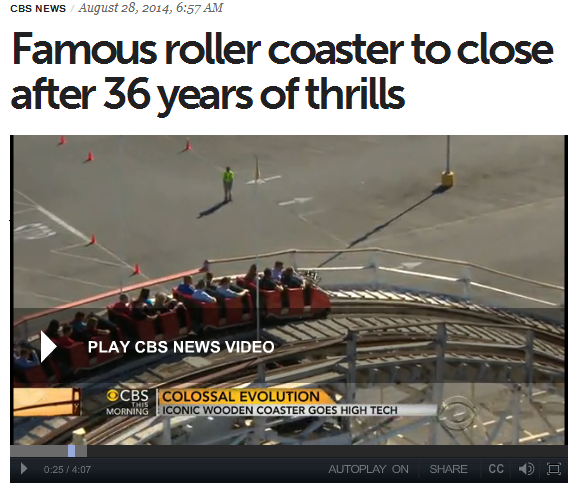 When Six Flags kicked off the summer by announcing Colossus is closing at the end of this season, the news was met with shock and disbelief. Colossus isn’t going away as much as evolving into a new coaster using hybrid technology: Twisted Colossus, where steel tracks are laid on top of the old wooden structure, giving riders the best of both worlds. Six Flags has already done this at four of its other parks, to rave reviews. The new, improved and twisted Colossus is scheduled to open next summer. Although a hybrid coaster provides better flexibility than a standard wooden coaster, the fact that the foundation remains wooden would still provide an element of uncertainty to the ride. As such, amusement park managers must emphasize safety and maintenance more than ever to prevent bolt failure. There are countless horror stories involving roller coaster accidents, so there is no need to go in-depth on the subject matter. Even just a single bolt giving way places the lives of passengers, as well as the lives of those within the vicinity of the structure, at grave risk. Do your part to keep park guests safe by having your roller coasters and other attractions undergo comprehensive bolt failure analysis. A fastener safety consultant like Guy T. Avellon can help detect potential risks and identify how to resolve them. In addition, specialist companies like GT Technical Consultants, Ltd. can train your employees on how to spot potential problems before they happen. According to the International Association of Amusement Parks and Attractions (IAAPA), the chance of an accident happening on a well-maintained roller coaster in the U.S. is 1 in 24 million. Although the odds are in your favor, you still need to work to make sure that the scales don’t tip against you. When it comes to the safety of your guests as well as to the long-term success of your business, being proactive is always preferable to being reactive.